At Green Top Grocery, fresh, delicious food is just the beginning. Nourish your family. Discover local foods. Connect with others and help build a strong community. It all comes together at Green Top Grocery. Eat well. Do good. Common Ground Grocery has been in Downtown Bloomington since 1977! Common Ground is a retailer of natural products that are sure to fit your needs and your budget. Our unmatched loyalty to the Bloomington-Normal market has allowed us to provide the area with environmentally friendly products for decades. That same loyalty has allowed our local operations to contribute just as much to our community as our community has contributed to us. Partnering with local farmers and businesses, we continue to deliver high quality products that benefit our consumers and our economy. Located on the historic downtown square, the Downtown Bloomington Association’s Farmers’ Market is managed by the Downtown Bloomington Association. Not only does the market give customers a colorful venue to buy locally grown farm products, it also puts them in touch with local artisans of prepared goods and fine arts, musicians, and community organizations. The Downtown Bloomington Association Farmers’ Market is a producer-only market offering a wide array of farm products — including vegetables, fruits, cheeses, pork, beef, free-range poultry and eggs, flowers, plants, herbs, and more grown and produced by the individual selling these items! We’re a 300 acre USDA Certified Organic family farm located in Atlanta, Illinois. We raise a diverse selection of vegetables, garden plants, fruit, cows, heritage breed pigs, chickens for eggs, and grains. Our farm is centered around the idea of diversity, soil health and lasting relationships with our community. We are a family owned farm providing natural Beef, Pork, Chicken, and Turkey. Our meat is hormone and steroid free. 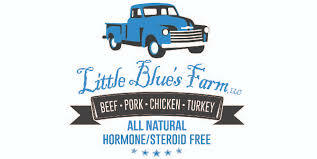 We are proud to say Little Blue's Farm, LLC is the place we call home. Starting in 2012 and with a long line of farming heritage in our blood, we knew this was a perfect fit for our family of 10. Our products are as all natural, hormone and steroid free as possible. We are small enough to take care of all of our animals on a personal level, yet large enough to offer some of the best products in the market. Charlie is proud to tend to his pampered “Above Normal” hens in their brand-new “Chicken Mansion” or in their luxurious Coop On Wheels. You can find him and his eggs every Saturday at the Downtown Bloomington Farmers’ Market on the Museum Square. 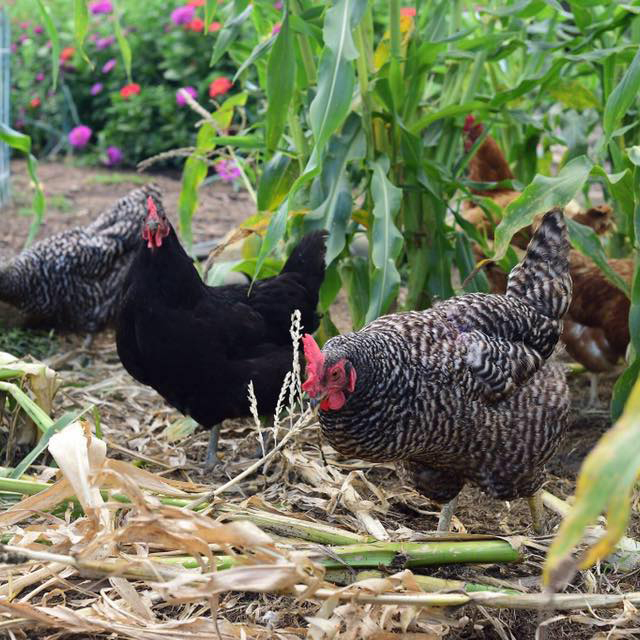 You can also schedule a visit to meet the hens at the farm! Each week for 24 weeks Traditional CSA members will receive a “share” of in-season vegetables harvested super fresh just for them. We strive for 5-7 different varieties per week. We also offer a trade table where members can trade veggies they don’t like for ones others traded. In addition, you’ll receive recipes and storage tips for the veggies in your share! We grow over 100 different varieties of vegetables so your shares should never get boring. You’ll also have the opportunity to order our other farm products such as meat, eggs and fruit, flowers, fruit, cheese, eggs, meat, mushrooms, honey and more!